Last night I returned home from work to find a road trip present from Mom. She is often in Northern California for work. She discovered Point Reyes, Anne's Cottage, and a lovely little town. 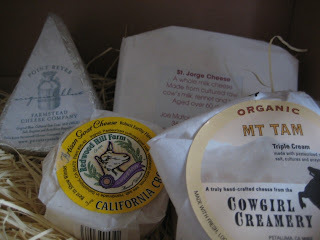 And because of this, I get boxes of cheese from Cowgirl Creamery! The Greco has already been notified. This post will serve notice to 'The Cheeze.' there is goodness to be shared this weekend. A good food weekend so far. Waiting for my pal John to get done with work I arrived in town with an hour or so to kill on Friday afternoon. I killed it at The Dubliner by having a few pints of the black stuff. That's Guiness. And you should like it too. The Dubliner is right next to Kelly's Irish Times. And you'd be happy at either. I think the Dubliner is a better spot to go on your own if you're killing time, and Kelly's is more open space and a better spot to take a group of people. But the pints at each are smooth and the staff at each are friendly folk. Met some young staffers from Dodd's office out after work. Good peeps enjoying a great job and knowing it. Friday night was celebratory Yeungling's at the Billy Goat Tavern on New Jersey Avenue. Senate side of the Hill. Celebrating John's promotion. Good man. Well-deserved. Snacked on some fries and had a late night Italian Beef sandwich that was H-O-T-T. When you order peppers on it, they load it up. Delicious fast-esque food. The Woodside Deli in Silver Spring, Maryland was the breakfast spot Saturday morning early. Those folks make good corned beef hash. Crispy on the edges. They also know what a customer wants when he orders a soft-poached egg. And they deliver. Excellent diner coffee. None of that metallic tasting pap some places will put out when they think the coffee need merely be hot and free on the refills. Met Bode and Ms. Kate at The Diner in Adam's Morgan for lunch. A favorite of the young, the hip, and the people who love 24-hour joints with funk-ti-fied diner menus. I, of course, am all of those things. My choice was the Popeye, a grilled cheese with feta, spinach, tomatoes, and garlic (veg sauted in Olive Oyl, ya' know). Bode went egg, bacon, and cheese on the muffin of the Englsh with cheese grits and Ms. Kate went ginormo-grilled chicken sammy. I have eaten many things at many hours of the day and night at the diner. It's a great spot. Everything, I think, a retro, post-modern, urban-hipster diner should be. We discussed impending weddings (Bode in May, Ms. Kate in June) and caught up on the worlds we live in these days. Crispy fries and good OJ helped. Relaxed for the afternoon and met up with the grad school gang for dinner last night. Logan Tavern was the dinner choice. A good neighborhood place. In this neighborhood that means a crush of young and not-as-young-anymore professionals mixing and jostling at the bar while waiting for a table. Two in our party went for their Southern Boneless Fried Chicken. Two went Wasabi Crusted Meatloaf. I went Roast Pork Loin in Sweet Asian Mustard. Damn tasty job of roasting the pork (tender)loin. The carmelized onion gravy on the fried chicken was friggin' awesome. And the bartender KNOWS how to pour a Manhattan up the right way. This is not about food. Not the kind that mothers and fathers are putting on their dining room table tonight, anyway. I let most of today wash over me. It was a time for others to speak. For others' words to ring out. But I choked up tonight when I had time to listen to my messages. Four years ago, a broken and battered campaigner woke in a hotel room in Detroit the day after an election and heard his mother's voice in a message say: "I just wanted to call and let you know the sun came up today." It was everything any son could have wanted to hear. It made me smile again and know that I could smile again. It was more comfort than any meal before or since. It was a mother's knowledge of what I had done, what it meant to me, and what would root it always in my mind as something that 'we' had done. Here is how I heard it played as a young boy growing up before campaigns, before it was a job, and when these notes meant hope for a new season of football on a hot August afternoon. They mean something more now. Thanks Mom, I could have have never done any of this without you. Yes, it's another filler post. Sorry. But this one is about Bacon's place in the social networking universe. Fans of Bacon now have a place to meet on Facebook. More posts soon. More Bacon now. If you love me, or even occasionally enjoy my foodie sarcasm, help out the good folks at SeriousEats.com by voting for them for a 2008 Weblog Awards. Seems KCAL has this story about the world's oldest woman crediting bacon for long life. Where Did You Get Your Sunday Supper? I got mine from Scotty and Dave.